Jayne A. 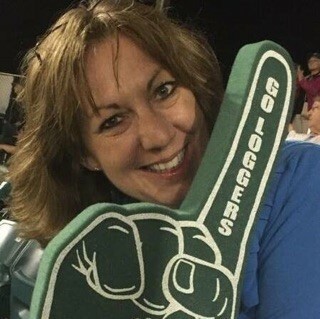 (Roou) Stalsberg, age 53 of Viroqua, passed away unexpectedly at her home on September 28th, 2018. She was born on June 22, 1965 to Charles and Janet (Nelson) Roou. She attended and graduated from Viroqua High School and the University of Wisconsin La Crosse. On July 10th, 1993 she married the love of her life Kevin Stalsberg and they then moved to Viroqua. Together they had a son, Mitchell. Jayne was her son Mitchell’s biggest fan. Jayne and Kevin were blessed to be able to see Mitch pitch various Pro Baseball games in Connecticut and most recently in Michigan. Jayne’s passion was education and teaching special education, she worked many places including North Crawford School District, Westby School District, and WEVA. Jayne had a strong faith and believed in keeping family together. She especially loved organizing many epic Roou Christmas gatherings. Jayne will be forever remembered for her quick wit, love of gardening and mostly for her impact on us all. She is survived by her loving husband Kevin Stalsberg of Viroqua; her son Mitchell Stalsberg of Viroqua; sister Mary (John) McLees of Stoddard; sister-in-law Peggy Crume of Viroqua; and a brother-in-law Arvid (Jerri) Stalsberg of Lincoln, Nebraska. She is also survived by nieces and nephews, Brannon McLees, Jason Crume, Jaime Crume, Matthew Stalsberg, Melanie (Stalsberg), Joanette (Stalsberg), Dave Holterman, Annie Stalsberg, Becky Droesler, Neil Stalsberg, TJ Stalsberg, Angie (Stalsberg). She is also survived by many other family and friends. She was preceded in death by her parents, and a brother-in-law Marlin Stalsberg, as well as other family and friends. The Thorson Funeral Home and Cremation Service of Viroqua is proudly serving the family.